Today, at about 4:45 AKDT (8:45 EST), NASA’s Messenger will become the first spacecraft to enter Mercury’s orbit. 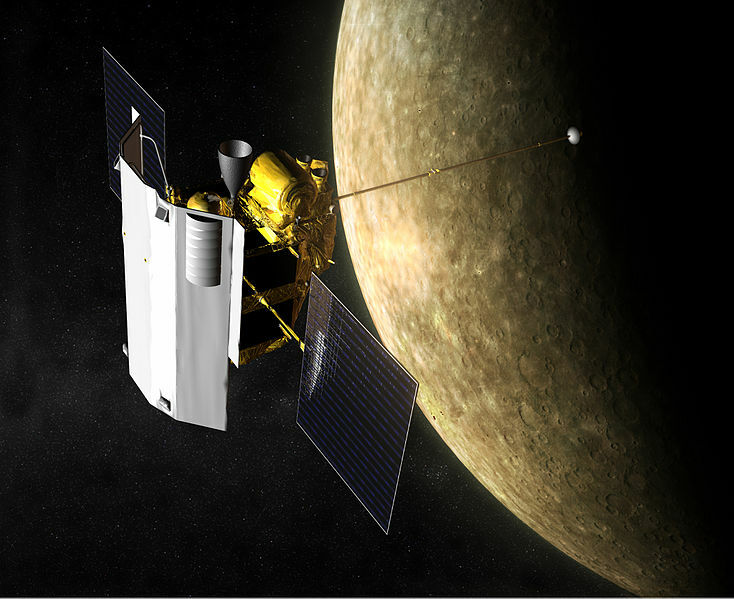 Messenger launched on August 3, 2004 and will undertake a plethora of scientific tasks, including studying the chemical composition, geology and magnetic field of Mercury. It should increase our understanding of Mercury’s geological history, investigate the presence of a liquid outer core, and determine why Mercury’s Northern and Southern poles are highly-reflective to radar (the hypothesis is ice!). NASA will broadcast a live webcast of the event: http://mfile.akamai.com/7111/live/reflector:22179.asx?bkup=22194 (streaming media link) beginning at 8:457:55pm EST. The first few days in orbit, the orbital commissioning phase, will focus on ensuring that the spacecraft systems are all working well in the harsh thermal environment of orbit. By March 24, Messenger’s instruments will be activated and checked out, with the science portion of the mission commencing on April 4. Tagged exploration, Mercury, Messenger, NASA, Planets.